Now at Nino's on Saturday night after having had half-a-dozen "boiler makers" at Lucy's , when you really need a couple of slices and want to eat them looking out a window while watching all the other drunks pass-by it will be much more complicated . 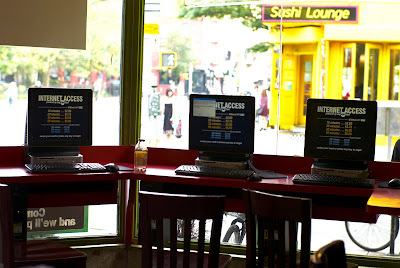 Now you will have to share that counter-space with a computer terminal . You'll have to be careful about where you sit , where you place your hot greasy slices and what you touch so as not to stain or gum-up that key-board ... as well as be sure not to sneeze or spit a gob of something organic on that monitor . 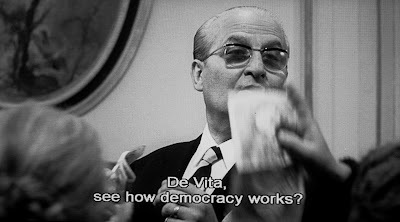 Images above from "Le Mani Sulla Citta`" directed by Francesco Rosi . 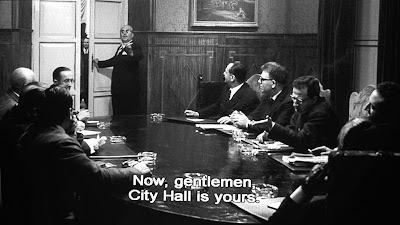 You can find a couple of minutes of this film , English translation "Hands Over the City" , on the internet in Italian with French subtitles . To view the entire film , recently released on DVD , with its worthy supplimenary disc though you'll have to either rent it or buy it . Netflix has it for rental and Barnes & Noble has it for sale . Your local video rental store likely has it too. 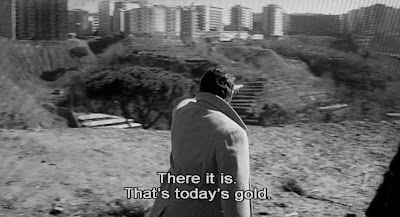 With this film you can watch Rod Steiger's lips move to English and speak Italian . 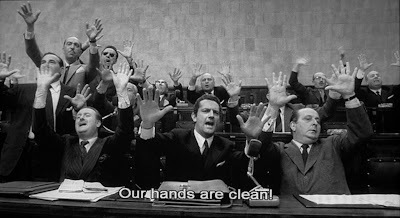 The closing title of "Hands Over the City" states "The characters and events shown are imaginary . The social and environmental context is real ". 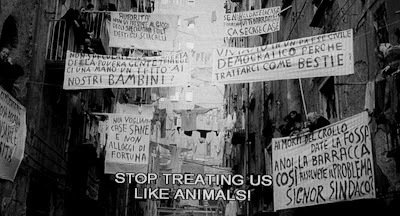 The environmental and social context is circa 1960 Napoli . 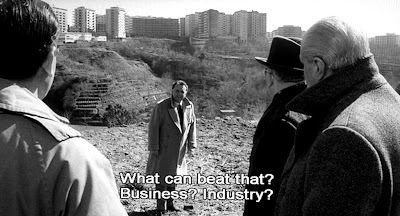 The subject is urban planning and failure with a Black&White Neapolitan setting . Actual city council members are among the actors . 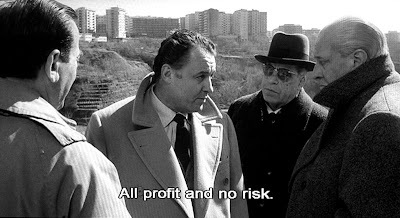 Rosi claims a realist film . 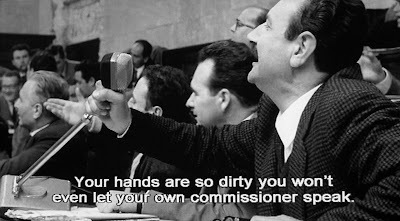 The relevance of this dramatically powerful and aesthetically beautiful B&W film today is that in its presentation , an almost continuous debate among the players , of government involvement with developers in Napoli , high-lighting men willingly participating in activities manifesting considerable conflict of interest and corruption , it provides numerous illuminated striking and significant parallels with the individuals , government agencies and corporations involved in the questionable on-going urban planning and property developement activities in today's New York City . Activities that are so effectively changing our city , mostly for the benifit of a wealthy few at the expense of what was once a dominating middle class .That is ,once upon-a-time the people that actually did the work in this town had a significant say in how it was run and could as well afford to live here . 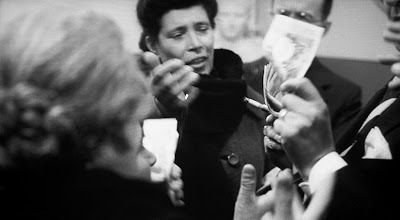 "A Neapolitan Diary " , on the supplimental disc , a documentary of Rosi's return to Napoli 30 years later made for Italian television , presents some of the consequences of the descisions and actions of 1960s. Perhaps also presaging some of the undesireable consequences to come of today's questionable on-going planning and developement activities here and now for the New York City of tomorrow . Monday night some of the tenants of 176 E. 3rd street and some of their neighbors gathered in front of their building to present their case to whomever would listen . The "Villager" was there . 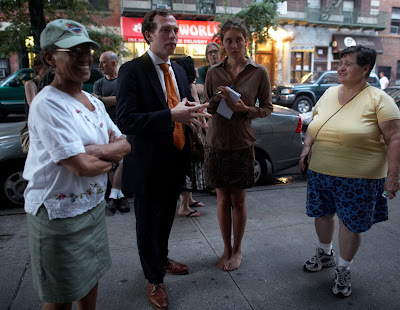 Luke Henry who is running for the state assembly against Sheldon Silver in the Democratic primary was also there . We were told that more reporters from other papers will visit the building and hear the tenants complaints of harassment in the next day or two . The event continued for 2 hours and a constantly changing crowd of neighbors and passers-by passed through stopping to listen and discuss the situation as it is today with landlords , developers and the lack of goverment protection of lawful tenats from such harassment and other unlawful behavior . More details of this situation at 176 E. 3rd street can be found at the previous post here at NMNL . We have been informed by Mr. Penley that he and his neighbors will gather Monday night to publicly present a claim of tenant harassment at their building . They will claim that their landlord is responsible for this harassment and that this harassment is being carried out by numerous illegal workers who are supposedly renovating many of the appartments in his 176 East 3rd street building . According to the DOB property profile and the city register this building is held by 176 East 3 LLC , which is according to the city register held by Terrence Lowenberg's Icon Group . According to the city register the deed for this property was transferred to 176 east 3 LLC on 27 August 2007 and on that same day this property was listed as one of 36 properties used to secure a mortgage of $105,000,000 . Mr. Lowenberg and Icon Group partner Todd Cohen were just this Sunday featured in a NY Post Page Six magazine story about the latest hot young developers along with young Benjamin Shaoul who is also according to the New York Times facing claims of tenant harassment . 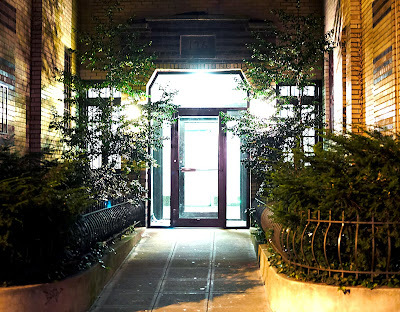 Much of the on-going work at this building it appears has been filed with the DOB but currently there are 3 outstanding violations for work well beyond the scope of the plans that were filed by Kenneth Hudes Atelier Architecture of Long Island City . Mr. Penley and several other tenants , many elderly and some younger with children , will gather in front of the building . At this press conference the tenants will provide details to the press concerning the nature and extent of the claimed harassment by the landlord and his mostly illegal workers . Mr. Penley also told us that some of the tenants of the Economakis building at 47 E 3rd street will join them in their press conference Monday night . Mr. Penley noted also that after the "Donut Social" at the 9th precinct on Sept 5th at 8 PM , he will lead not only a march to the Economakis building at 47 E 3rd street to protest there but will also then lead a march to his residence at 176 East 3rd street for a protest there on that Friday night also .